Can't wait to finish your project? Don't skip these essential steps! No, I take that back. I really dislike sanding, but I hate the thought of sanding. I have done a lot of woodworking projects over the years, from building a few simple things of my own design, to refinishing nice pieces of old furniture. They were all DIY projects, and I must say that I like the finished product, or at least the anticipation of it, which is why I ended up starting all of those projects in the first place. Now, I will first say that I did finish all of those projects, but I readily admit that there were times in each project where I felt like, oh, I don't know, maybe taking a few shortcuts. Because I really, really hate sanding. I enjoy stripping back old furniture as layer after layer of old paint or darkened varnish slowly peels back to show the fine grain lines of the wood beneath. I even put up with the occasional chemical burn if a bit of the stripper got past my gloves or brushed my arm. Of course, work stopped and I washed it off pretty quickly, but I was always keen to return and finish stripping the piece. I take a lot of pride in my work - corners should be square, there should be no bumps, rough bits or holes in the wood, and the finished surface should feel perfectly smooth to the touch. You have to strip off all of the old finish, or it will become immediately obvious when you put new varnish on the old furniture. However, where I struggle the most, and feel the most temptation to take a few shortcuts, or even do a half-ways job of it - is when it comes to sanding. You know, rubbing with those bits of paper with sand glued onto them, scraping off the rough bits of wood, removing the last bits of the previous finish, and making everything smooth and uniform, ready for the next stage. Sanding is messy, the dust goes everywhere - and it can take a long time to do as you go through finer and finer grades of sandpaper. 80 grit - then 120 - then 150 - then 220 and sometimes finer depending what you are doing. 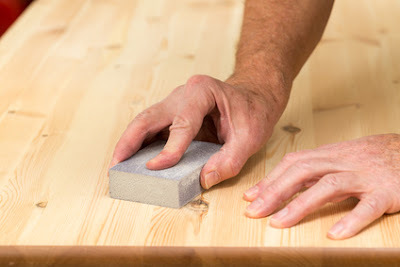 You have to clean the surface between sanding rounds as well - so each time you start with a better and better surface, and don't immediately gunk up the finer sandpaper with old dust. When you are in the middle of it, it can seem like everything else before this stage went really quickly in comparison. Especially if you hate sanding. The problem is that sanding is possibly the most important part of finishing the project, and is often neglected or done poorly. How many times have you heard someone say, "Oh don't worry too much, the paint will hide the flaws." I have heard that lie plenty in my life - and that is what it is - a straight-out lie. I think it was started by someone who, like me, really hated sanding, and just wanted to get on with finishing the job. Because, let's face facts - when you have been working hard and are most of the way there and there are only a couple (painful, annoying or difficult) things remaining between where you are now and the finished product, it is very, very tempting to try and finish up those bits in the middle really quickly, maybe skip some of them, or just ignore them completely. Because, as that infamous person said, "The paint will cover it." "Sure - that nail head will disappear when you paint." "Nah, that chip will just blend in." "Don't worry about removing all of the old finish." "Nobody will notice those small holes." Lies, all of them. Well, they might actually be true when the lights are all off and you are sitting in the dark on the other side of the room - but that may be the only exception. The truth is that the paint or varnish hides nothing - it actually highlights every single flaw you left behind. At some point of the day, in the changing light, you will be able to find every one of those flaws. And if you are like me, they will bug you - and be a constant reminder of a job not done to your best standard. The other truth is that old, tired paint on old, battered furniture kind of fits together - sure it looks terrible, but what do you expect of an old piece of furniture? However, as soon as you put fresh paint on it, your expectations increase - and your eyes catch even more flaws than you did before. So if you did nothing more than repaint the wood piece, it actually will look worse than before, because it looks like you didn't care about doing the job properly. Which is why - as much as I hate sanding, I know that I need to do it. Not only that, I need to do a really good job of it, or it will show - always - in the finished product. On DIY projects, sanding is a key aspect of surface preparation. Proper preparation of the surface helps to ensure that your finishing coat, be it paint or varnish, will adhere properly and last a long time. Of course, you also have to get the 'bones' right - if you are building something new, corners should be square, you should use quality materials, and use your best craftsmanship when you put it all together. If you are refinishing something old, you need to make any required repairs and prepare the surface before you apply any new sealant. But lest we get too focused on DIY, it is important to note that this same principle applies to your work projects as well, no matter your industry. Every project has its own elements of 'surface preparation' that make the difference between a successful project and one you may be embarrassed about (i.e. a failure). These are the things that help make things 'stick', and allow you to successfully embed the changes delivered by your project into the organization so they last. Just like you need to work through the various grades of sandpaper from coarse to fine, you need to engage in key project activities in a certain order as well. If you don't, you can end up working too hard (starting with too fine a grit will take longer to get the job done, and use a lot more sandpaper), or destroying what work you have already done (using a coarse grit after a fine one will introduce deep scratches). Note that this is not 'gold-plating', which involves extra, wasted effort on minor details - I am talking about essential things that make a material difference to project outcomes. There are three things that are commonly neglected to varying degees (particularly on failed projects). On every good project, your stakeholders should be involved right from the start. The problem is, on some projects that is also when the engagement stops. "Tell us what you want, and we'll deliver it to you sometime in the next year or so." Then, at the appointed time (often several months late), you handover the completed project outcomes to the stakeholders. "Ta-da!" There are significant problems with that approach, aside from the fact you probably delivered something that did not quite match their expectations, because you did not keep in touch. Stakeholder engagement starts out like coarse grit sandpaper - it is the foundation you need to build upon to set the project up for success. It is important to start this early - there is no point in trying to engage your stakeholders at the end of the project, if you have mostly neglected them up until now. If you maintain open communication with your stakeholders, you will be keeping them engaged, as well as having them there to support you in making decisions when conditions change. If you have consistent, positive engagement with your stakeholders, you will smoothly progress through the 'grit' stages, from coarse to finer and super-fine, so that by the end of your project, your project outcomes are well received and delivered with a silky-smooth finish. However, should you fail to keep your stakeholders in the loop, you will revert straight back to 80-grit when things get tough. If you have not kept them close and up to speed, bringing them in for key decisions (or during a crisis) can set you back to square one, with coarse scratches all over your project (not to mention your reputation). It won't necessarily take that much time out of your week to keep your stakeholders involved and aware of what is going on, but the cost of neglecting to do so can be high. Change management is important to any project involving people - and the last time I checked, people request projects be done, and the outcomes are for people. Granted, some project deliverables may be mass-market products for the nameless masses, but even then there are aspects of change management that need to be considered. Are you retooling a production line? Who needs to be trained on how to manufacture the new product? 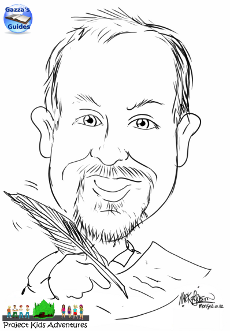 Will you be getting questions from customers about the new product or its benefits? Most projects have some level of impact on your organization, or that of your customers, particularly if you are improving processes or changing how things are done if you introduce a new system. This area can be a bit of a challenge - as we don't always how how things are going to change, exactly, when the project starts. However, you need to plan and prepare from an early stage of your project, developing and updating your communication plan and other tools as you learn more about the potential, specific impacts of your project, as well as continuing to learn more about your affected stakeholders. If you start early and keep smoothing off the rough edges as you go, you will usually end up with satisfied stakeholders, happy customers, and site references for your next big job. (You may also end up with a nice polished wood desk to put your feet up on). If you try to introduce "change management" near the end of your project (if at all), it will be a lot rougher on the stakeholders and project team alike. Nobody likes surprises, or being advised of changes last minute - particularly when they affect people's jobs or how they work. It would be like pulling out a sheet of 120 grit and messing up the fine work you have done so far...but if you really botch it up, it could be far, far worse...think 80 grit, or perhaps even a metal rasp gouging chunks out of your fine piece of crafted wood. 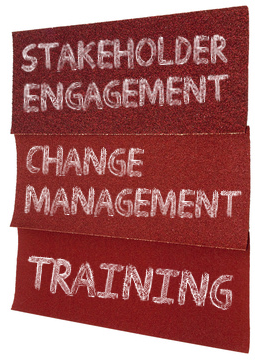 Some people may say that training is part of change management, and that is true - there are many facets to managing change. However, I have separated it out here because some people may think that all you need to do when you deliver the project is train people at the end, hand things over, and you are finished. While training of your average users will occur near the end of the project, preparation for that training needs to start well before then. You can't train people too early, or they will forget, and you will then need to retrain them. Train them at the right time - which will be close to the end of your project, generally - about when you would expect to be moving on from 150 grit to 220 grit, and then finishing up on a polished note with 320 grit. However, if you neglect to prepare for and deliver appropriate training, or do half a job of it, it will be like someone stole your toolbox and you won't be able to finish off the job properly. You might get stuck with a 150 grit surface, with all of that shiny varnish showing up every fine scratch and flaw. When you are working with wood, you soon learn how important it is to sand "with" the grain - moving parallel to the lines in the wood. When you do this, the scratches of the successive finer and finer grit papers finally blend into the features of the wood, resulting in a 'polished finish'. However, if you sand across the grain - even with a relatively fine sandpaper, the scratches become very noticeable. Sometimes, people would just like to get through the project as quickly as possible so they can just "get it done". This is even more likely to happen when you are running behind schedule. If your project has been going on for a long time, or has had many high-intensity periods, people get tired. They may be worn-out and are less likely to focus on details, or may want to skimp on the work left to be done. They may see these extra tasks on the project plan as unimportant, because they cannot see how they will make a difference in the big picture. But make a difference they do. It takes true grit - persistence and commitment - to make sure that your team does not take shortcuts or omit any key steps because of time or cost pressure - or simply because people are getting tired. If they side-step the process, it can be just like dragging a sheet of sandpaper sideways across the grain, leaving tell-tale scratches. 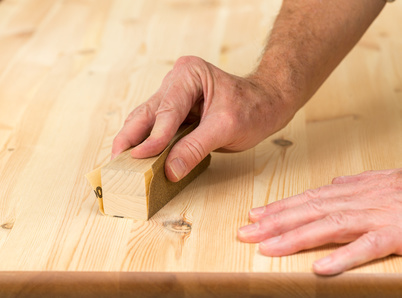 And just like sanding wood, if you take shortcuts like that to get off the board, it can end up taking even more effort to correct the problem and get the desired finish. Stay with the grain, do all of that "other" important work, like maintaining your stakeholder relationships, developing a good change management plan, and doing a decent job of training affected people. The results will be worth it. I still hate sanding - but I know that I have to do it properly as part of the final surface preparation - or it will show through and regularly remind me that I could have done a better job. Sometimes, the flaw is so visible or annoying that I need to repair it right away, and varnish is the most unforgiving substance on the planet. (Which is, frankly, a horrible job, as it requires stripping back to the bare wood and doing it all properly again...but some projects are like that). On your projects, due care and attention to detail is important from start to finish - and make sure not to let the rough bits get through. Give the same level of committed effort to 'surface preparation' as the rest of your project, and this will help ensure that things go smoothly so you can finish your project and hand it over with pride. Good luck on your projects, and remember to keep some sandpaper handy to deal with the rough patches.